Looking at your spine from the back side, the lamina is an arch of bone spanning from one side of the vertebra to the other with a projection of bone in its center called the spinous process.It acts as a protective roof over the spinal cord and its nerves. This roof goes on and connects with other bony structures on either side of the vertebra to ultimately form a ring or conduit at each level of the spine. The vertebral body is the thick cylindrical bone to which this lamina is attached on the back side. Over time arthritis, bone spurs, bulging or herniated discs start to push inward like corrosion building up in a pipe and squeeze or irritate the nerves or cord running up and down. Laminectomy creates room for the nerves and cord by removing small portions of the lamina. 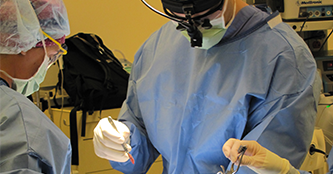 It is performed in the low back using minimally invasive techniques as outpatient.